Limited offer: Receive a free Eye Make-up Remover sample and Cosmetic Sponge with your purchase. Soothing Cleansing Milk gently removes dirt and make-up prior to cleansing with Cleansing Cream. For sensitive skin, Soothing Cleansing Milk is a daily cleanser with harmonizing, protective properties that help diminish the appearance of redness. Soothing Cleansing Milk can be used as a gentle shaving lotion. Formulation: Anthyllis, jojoba and almond oil maintain the skin’s natural protective function. A nutrient-rich extract of fermented grains and bentonite clay effectively cleanse as they calm skin and reduce the appearance of redness. It feels like I have new skin. I've used Dr. Hauschka products for a long time and I have never been let down. They are excellent. I do recommend them. Another all time favorite, this cleanser is gentle and great at removing makeup. I highly recommend it. I have been using this product for 15 years. It keeps my skin clear and youthful. I have been using Dr.Hauschka products for over 20 years, and started with the cleansing milk. I like the scent and how luxurious my skin feels after using it. I am a daughter of the Swiss Oberland, and always felt that my skin responded intuitively to the formula of natural ingredients used in the products. I have been using this product for years to gently cleanse my face at night. It is gentle but effective for my dry, sensitive, and mature skin. 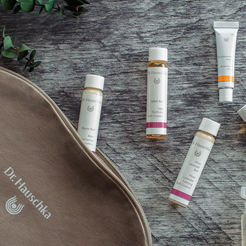 You can just tell the quality of the ingredients when using Dr. Hauschka products. This cleanser is gentle yet takes all the makeup off. I highly recommend all of Dr. Hauschka products. Now I use this every morning and every evening, because it is really gentle on my skin and also easy to use. Would recommend to anyone looking for a gentle cleanser! I have been using the cleanser for years. It is the only cleanser that removes makeup and does not irritate my skin. The Soothing Cleansing Milk is easy to apply and works wonderfully. It takes two to three pumps for my neck and face to be covered. It has a clean, fresh scent that begins the relaxation routine of cleansing my face. Very calming and nurturing to my skin. I love the way it gently cleanses my skin and leaves it feeling hydrated and soft. Will purchase again! Great for sensitive, dry, mature skin. I have been using this product for more than two years. It's great for my sensitive, dry, mature skin! It does not leave my skin feeling dry, just soft and smooth. appreciate the lightness of this product. Leaves skin feeling clean and refreshed. Great for sensitive and/or dry skin. Gently and effectively removes all kinds of makeup. I apply the product and then remove it with a wet washcloth. Non irritating with a pleasant herbal aroma. Another great product. Before I started using your Soothing Mask, in all honesty, I would apply this lightly, and then leave it on. I don't wear face makeup every day, but when I would go out and wanted to wear makeup, I would apply it over the cleansing milk. My makeup never caked, and you know what else, my skin didn't dry out from the makeup. On it's own though a lovely perfect and effective cleansing lotion. In this frigid cold weather and indoors with constant artificial heat, this is just what my face needs to help stay hydrated without a heavy or oily feel! Thank you Dr Hauschka! I highly recommend this creamy product- it not only takes your makeup off but it soothes the skin in the process. I suggest following cleanser with some type of soothing toner to take off any remaining dirt. After using cleansing milk my skins feel nourished and moisturized. This product effectively removes make-up and is truly soothing. I have noticed an improvement in my skin in the 4 weeks that I have used it. With sensitive skin and getting older, I spent a year trying various brands that touted safer ingredients and good results. I’ve been happily using Dr. H. for two years now. I’m a recent convert to the cleansing milk, rarely use soap now. My skin tends to dry out in winter and it’s been a big boost to keeping it moisturized; nice texture and goes on smoothly. I build on it with a toner, day cream, and moisturizer. SPF in last if I’m going out. Silky soft , lightly scented cleanser that easily removes my makeup. Leaves my skin soft and clean when I do a final swipe with the Dr Hauschka sponge. I love the smell and feel of this product. It feels heavenly and like I am getting the royal treatment each morning I use it. I've been using the cleansing milk for 10 years now. It cleanses my face without being too harsh and leaves my skin soft and silky feeling. Also, very good for removing makeup. You won't be disappointed with this product! This product made a difference in only a week after using it. This gentle and soothing milk cleanses the skin well, leaving it satiny, hydrated and refreshed. Excellent for morning, evening and anytime use. A must during travelling, as it enlivens the complexion and feels fabulous. I was introduced to Dr. Hauschka in 1993 when I ran out of facial cleanser while I was in Munich, Germany. I still use it everyday. Now I'm in my 50's, and it has helped my skin remain youthful, soft and clean. I highly recommend it. In fact a few years ago, I was at Sephora, and I asked for Dr. Hauschka. The sales representative said they had stopped selling Dr. Hauschka. He showed me some alternatives, but even he admitted that Dr. Hauschka was the best. One of the best Hydration Cleansers I’ve ever used. I've tried many cleansing products and this one was the winner. I have very "complicated" skin. It is super dry and easily irritated. Soothing Cleansing Milk is the only cleanser that does not dry out or irritate my skin. I use it to take off my make up and works very well. Even though for now I use it to take off my eye make up too when it get's into my eyes it stings quite a lot but I am still in the search for a separate eye make up remover that doesn't irritate my eyes and the skin around it. I like this product very much. The Best for Problem Skin! Splashing water on my face turns it red-- That's how much a problem it is. I can count on Soothing Cleansing Milk to clean my face without irritation. I have used it for years, and every time I touch my skin with something new, I remember why. I highly recommend this product. This cleanser is mild and gentle and cleans excellently! It smells very nicely too. I have been using it for 15 years and love it! I have used Soothing Cleansing Milk for a number of years. I use it daily on my face, and I love it! It cleans my skin well, removes my eye makeup easily, and leaves my skin moist and soft. This cleansing product is wonderful for dry skin. It cleanses without drying. I love this cleanser. It removes my make-up so gently and doesn't dry my skin out one bit, which is so important for me now that I'm living in a desert climate. My skin feels best when I follow with the cream cleanser but some days, when I'm not wearing make-up and I have very little time, I will only use this Cleansing Milk and my skin feels great. Love this gentle cleanser...makes my skin feel soft. Really makes my face feel good. However sometimes I don’t feel like it cleanses enough but that may be because of its ingredients. My favorite cleanser of all! I have been using this product for several years. I love the fact that it is a cleanser and a make-up remover all in one. It leaves my skin clean, soft and supple. I like using this to take my make up off, it’s gentle in eye makeup and leaves my skin nice. I love this Cleansing cream as it leaves my sensitive skin feeling refreshed and clean. It is delicate enough not to irritate and strong enough to remove makeup and environmental debris. I truly loved how this cleanser made my skin feel, unfortunately I did have a breakout afterwards of milia a few days after. Otherwise would have been great! I love the Soothing Cleansing Milk! It is perfect for my dry, sensitive skin even in the winter, and it doesn't irritate my eyes. The scent is very light and pleasant. I have been using it for years. This is very gentle. If I only use this I will break out. However it is great as a first cleanse to remove make up or as a cleanser if you have already bathed that day and not gotten too dirty but want a nice moisturized face. Doesn't strip. I have used this product as my daily cleanser for quite a few years now. It leaves my skin feeling soft and not dry. My daughter loves it as well, and uses this cleanser exclusively. Wet face with warm water. Gently apply a thin, even layer (1-2 pumps) to face, neck, and décolleté, working from your forehead down and from the center out. To remove eye make-up, apply to a dampened cotton pad and use gentle sweeping movements from the inside to the outside corner of your closed eye. Do not scrub. Turn pad over and wipe the eyelid area to rinse. After removing make-up, we recommend the use of Cleansing Cream for normal, dry, oily, mature and blemished skin. Follow cleansing with the appropriate toner or serum for your skin condition.